A simple unified theory of everything . I get more and more perplexed by theories of the universe that propose more and more particles with bizarre behaviour or worse. I also find it extraordinary when theories in one area contradict theories in another area and nobody blinks an eyelid. Then these theories get access to vast millions of resources for the next big experiment, without any satisfactory basis for explaining the last lot of results. I was taught that the more fudge factors that you need to invent the more likely that your theories are wrong, and I still believe it to be true and will continue to teach it to my own students. Particle theories and Big Bang theories of the universe seem to be built of huge pyramids of fudge factors. We have good evidence for two basic building blocks of matter. The proton and the electron. I propose that the proton IS a wave whose distribution follows an inverse square law in the dimensions of space, time and charge. A view of this can be represented by a two dimensional curve: The sides of this curve reach out to the end of the universe. 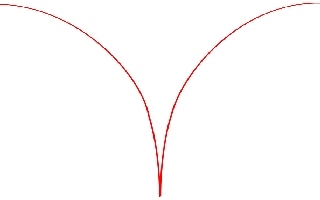 If your instruments or experiments are reacting with the upper part of a curve you will see a wave. If they are reacting with the lower part you will find that the proton is more like a particle. In space and time, this curve is the property that we know as gravity, or mass. Particles are attracted to each other by this property. This property is summed to produce the gravity of the earth, the sun, or the solar system. In a similar way the property of charge forms a dimension of this wave. It also follows an inverse square law, but similar waves of charge repel each other, but are attracted to the opposite charge. The charge dimension of the electron is similar to that of the proton, but of the opposite charge. Like the proton it also has mass, but much smaller than the proton. Again, if your instruments or experiments are reacting with the upper part of a curve you will see a wave. If they are reacting with the lower part you will find that the electron is more like a particle. Any attempt to locate the electron, or proton, in one position fail because of its wave nature – not because of any quantum theory. A single proton cannot capture an electron in the narrow base of the wave because the energy of the travelling electron wave is too great. The single proton can only capture an electron in the lowest orbit in the neck of the wave. But two protons together can hold onto an electron in the narrow base of one of the protons. We call this captured proton electron pair a neutron. A neutron cannot exist for long on its own. If a neutron is separated from its other protons, the electron will escape, leaving a proton behind. Protons don’t interact with each other as hard points in the middle of the nucleus of the atom. They are diffuse objects both in respect of their mass and of their charge. The same with the electron. The size of an atom can be defined as the sphere that represents the boundary where the positive charge from the protons equals the negative charge from the electrons. Within this sphere the protons and electrons exists as overlapping patterns of charge. The motion of each is determined by the overall field strength of charge and mass in relation to its own field strength throughout that sphere. This can be mathematically simplified to consider the charge and mass of both protons and electrons to act at a point in the centre of the sphere. Since the charges are equal and opposite, and the mass (gravity) additive, no other force is needed to hold the nucleus together. Since the wave that represents mass is additive, the mass of a planet, the sun or a solar system is simply the sum total of all the particles that make it up – and produces Einstein’s gravity well and the curvature of space time. There is a conflict here between the discussion of relative velocity, reference frames and the speed of light, and gravity as curvature of space time. If gravity (mass) follows the inverse square law, and effectively every particle extends out to the ends of the universe, it is impossible for any object to travel in its own reference frame within this universe, because it is always within the gravitic influence of every particle that exists. The edifice of particle physics is built on a little anomaly – the decay of the neutron to a proton and an electron produces an observed total momentum that doesn’t match that observed before the decay. The neutrino was invented as the fudge factor needed to balance the energy budget. This produces the odd deduction that a proton can only capture an electron to form a neutron if it is hit by a neutrino at just the right angle to match the trajectory of the approaching electron. This seems to me to be a very unlikely scenario. The missing energy is more likely to be related to the angular momentum of the proton – electron pair as they orbit round each other and move apart. A good analogy is that of an athlete throwing a heavy weight on a chain. The athlete moves in a small circle balancing the weight of the ball moving in a much larger circle. As they part company the ball could fly off in any direction from that circle. Since the proton and electron are still experiencing each others charge as they move apart, they won’t simply move off in opposite directions. In this theory there is no need to require a chance exotic particle to come by just when a neutron is produced. Since the charge dimension is nicely symmetrical it is useful to speculate if the gravity dimensions are equally symmetrical. I would speculate that space and time could form a curve with the opposite curvature to matter here. A proton or electron in such a reverse space time wave would have identical properties to matter here in relation to other reverse gravity protons or electrons. To maintain symmetry the reverse gravity protons would have a negative charge, and reverse gravity electrons a positive charge. Ordinary atoms and reverse gravity atoms would, I think, repel each other in the gravity (space time dimension). This provides a neat explanation for any forces causing expansion of the universe (if indeed it is expanding). Some galaxies would be normal gravity. Other distant galaxies would be reverse gravity, and the force of gravity between them would be one of repulsion. Within either galaxy you wouldn’t know the difference. The total mass of the universe is thus zero, and the total charge of the universe is also zero. Very elegant and satisfying! If e=M*C^2, this would suggest that the total energy of the universe is also zero. This implies that the energy of an antigravity galaxy is opposite sign to a normal galaxy – which we have already deduced in the diagram above. If ordinary matter and reverse gravity matter had not completely separated out then science fiction writers can claim to have utilised the consequences in floating cities and vast space craft that drift effortlessly through the planets gravity well. 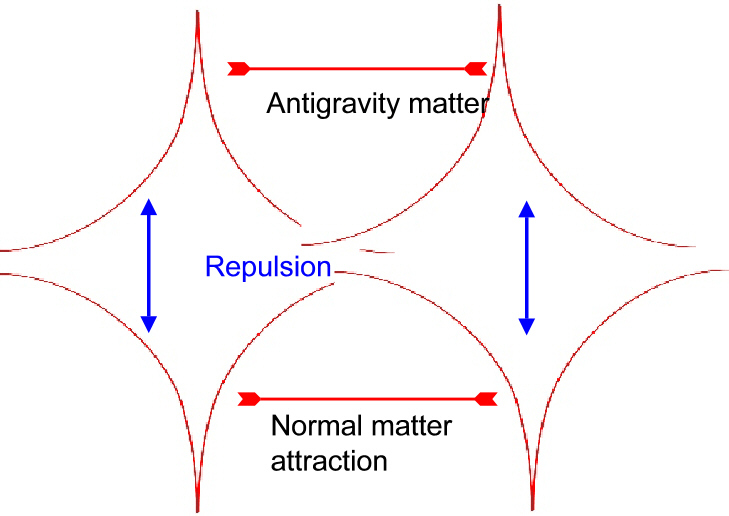 Equal masses of the two types of matter would effectively cancel gravity, but could be held in place by charge fields. They would however have tremendous problems following the corkscrew path that our planet follows through space, unless tethered to the planet in some way! Charge is a far more powerful force than gravity, but follows the same inverse square law, and it is reasonable to suppose that this is for the same reason. Charge is simply the curvature of the proton and electron into another dimension, but with different properties, so that similar charges repel and dissimilar charges attract. Magnetism is a much more difficult force to place in such a model if you have spent all your life with the concept of poles that always come in pairs. Instead I am going to propose a hypothesis that the concept of magnetic poles is simply a derivative of either a proton or electron moving through our dimensions of space time and charge: Take two conducting wires each carrying the same current in the same direction. These wires experience a force that pushes the wires towards each other. Their charge is neutral because the negative electrons are balanced by positive protons. Let us re-state our observations, not in terms of a magnetic field, but simply that electrons, not travelling in parallel, will experience a turning effect that pushes them in the direction that encourages them to move in parallel. Consider a fixed loop of wire carrying a current. Alongside it a second loop of wire free to turn. If a current is passed through both wires, the free loop will turn until the loops are parallel. Reverse the current in one loop and the free loop will turn again until the loops are carrying current in the same direction. Conventional explanation postulates magnetic poles, but we have accounted for exactly the same effect without the need to develop a concept of pairs of poles. The magnetic pole is a useful concept, but is it an artefact of the explanation, not a physical reality? The underlying mechanism requires more thought. The vibration produced as an electron crosses variations in the field intensity from a much greater number of electrons moving in parallel? Relativistic effects as electrons move in parallel? The concept of the electromagnetic field is built deeply into modern physics – and the mathematical formulation of these theories works. It doesn’t necessarily follow that we need north and south poles as entities. The mathematics of charge and gravity are very similar – but they are fundamentally different properties of matter. Because we have a mathematical model that works doesn’t mean that its translation into the real world is correct. Maxwell realised over 100 years ago that the field of an electron extends beyond the wire it flows through into the space that surrounds it. This displacement current was formulated in terms of magnetism, but suppose it merely reflects the structure of the electron – only the narrowest part of the wave fits within the wire, but the broader more diffuse part extends outwards. The concept of the particle as a discrete object, and the magnetic fields around it were developed to predict and then explain the formation of radio waves. But in our wave model the protons and electrons already extend out into space. There is no discrete boundary where vibration of the particle ends and electromagnetic transmission of a radio wave starts. Can electromagnetic radiation be explained as the vibration of the electrons (and / or protons) extending out into space, simply as vibrations of our dimensions of space/ time and charge? Gluons and the rest are not needed. Some other bits that worry me. Diffraction and double slits is a concept that seems fine – provided it is the physical presence of the wall of the slit that is responsible for the diffraction. Two fine beams of light don’t diffract until you put a physical barrier in their path. I can have any number of virtual slits with no diffraction – until I put a physical slit in place. A particle wave cannot pass through any physical slit without physically interacting with the atoms that make up the walls of the slit, because the particle wave is always bigger than the slit. Is background radiation in space being left over from the big bang? – every dust particle floating in space throughout the universe will reflect some light, absorb other photons and re radiate at a different wavelengths, or diffract photons that graze the surface, scattering, modifying, for billions of years. I cannot accept that any wavelength remains unchanged for that length of time. Virtual particles are not needed and don’t exist. They are part of the fudge factor mountain. What are high energy colliders detecting? Meanwhile another group of researchers hit a very similar target substance with a very tiny projectile and get this beautiful crown with tiny round beads – and propose a completely different set of particles based on the crown and beads theory. Each year a few students shake their heads and claim that the substance at the bottom of the well may be a liquid, but since they don’t fit in and nobody will publish their ideas they go on to make a fortune in medical drugs research, or develop the Internet.